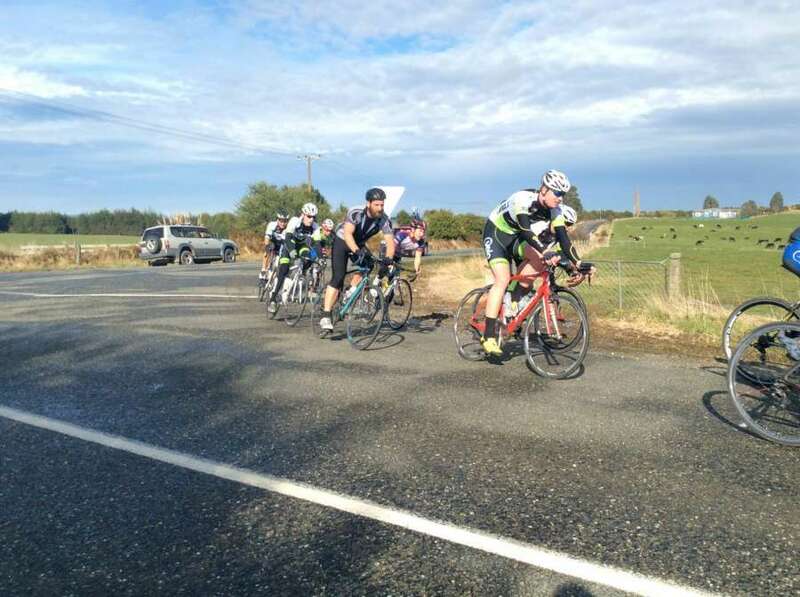 With the forecast looking very dodgy at the start of the day riders prepared for the worst at the Cycling Southland Dacre-Hedgehope handicap race on Saturday but, to everyone’s surprise, there wasn’t a spit of rain and the sun even showed its face. 38 riders split into six bunches set out on the hilly course with 38mins difference from Limit and Scratch. Chris Russell proved too strong for the other limit riders and rode roughly 60km out of the 70km course alone, to only be picked up by the chasing bunch but still managed to stand on the podium. The first three bunches finished together and the sprint being won by Joe Swale in his second-ever road race – Swale is a newcomer who has recently swapped from rowing to cycling. Second place went to our hardy Alexandra traveller Martyn Williamson, with Chris Russell hot on his tale and Martyn’s wife Liz taking fourth place and first female of the day title. Tom Sexton took out the fastest time with 1:33:49. Speeds were very impressive with Limit averaging 32kph, 2nd & 3rd Limit averaging 35kph, Mid averaging 38kph, Break averaging 39.3km and Scratch averaging 43.9kph. Swale led the bunch in completing the course in 1:57:44 with Mid finishing the course in 1:52:49, Break 1:40:40 and Scratch 1:33.49. Great to see some surprise entries such as Paul Clark and Blair Lasenby. Thanks to all who competed and help the race run smoothly. Next weekend is a two-race event with the Tisbury Time Trial and Teams Race.